This book is so thought provoking that I plan to buy 5 more copies and share with important people in my life. 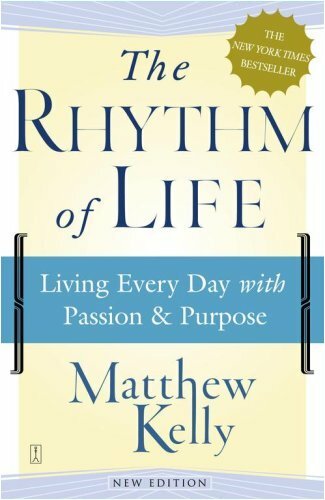 I enjoyed the insightfulness of Matthew Kelly--this was the first book I have read of his and have moved on to Perfectly Yourself: 9 Lessons for Enduring Happiness. Kelly's ideas as to how to become "the best version of yourself"
and read by Matthew Kelly, as much as I did. to become "the best version of yourself." about many of the points he raised. past. But you can change your future. * Relationships thrive on one thing: carefree timelessness. * Life is short. And you're dead a long time. Live passionately. * The challenge is to have fun doing work. * Successful people just have better habits. to bed every night starving for 1 kind word of appreciation. * Make it a habit of making somebody's day. Every day. Nothing ground-breaking, but a good thing to read if you need to revisit the easily-forgettable obvious. This is all excellent advice. I've heard it before, but it never hurts to hear it again. It's easy to lose yourself in living day-to-day and pursuing goal after goal. The author uses parables all the time--as a would-be Jesus would--and sometimes has to really cram to get them all in. Lots and lots of inspirational quotes that you've probably already been forwarded via email a zillion times. If someone gives you this book, or if you find a copy for a few bucks, or if you are new to these ideas, this book is nearly as good as any I've encountered. This is an excellent book. I would even suggest that it's a good choice for a book to read after The Purpose-Driven Life. I was leery at first that Kelly seems to advocate that you should simply pursue whatever you have a passion for. However, as he encourages you to become "the best version of yourself" he draws you toward the passions that are most worthwhile. The book also contains practical advice on how to become the best version of yourself: something The Purpose-Driven Life lacked somewhat. One of the best 'purpose-driven' books that I've read! If you're checking out this review, you're interested in becoming a better person, or as Kelly says, a better version of yourself. Kudos. This book will help you do it. It has brought a certain clarity to my inner monologue that I have never before felt. And just so you know, I've read so many self-help books and books on seeking happiness I can't begin to list them here. (Relatively) Recently written books like "The 7 habits" and Dale Carnegie's "How to", all the way to Existentialist writers like Camus and enlightened thinkers such as Thoreau and ancient philosophers such as Aristotle and Plato. Whether or not you have, this book will put all the others into perspective. It will show you how those books, and this one, will help you on your journey of becoming the best version of yourself, and the byproduct (happiness) which comes from embracing this journey. One last note...I subscribe to no particular faith, and I have avoided reading Kelly despite some of my friends recommendations because his books are always in the Christian section of the book store. I guarantee you that whether you are a born again Christian or an agnostic, this book can help you.